Sober Look: Who is cheating on their Opec production quota? Who is cheating on their Opec production quota? The answer is everyone, except for Libya. 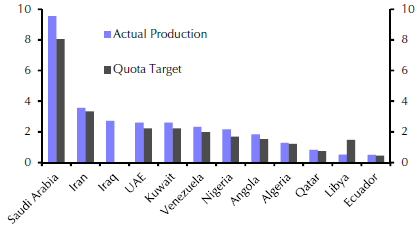 The chart below compares the Opec quota with the actual production (in million barrels per day). 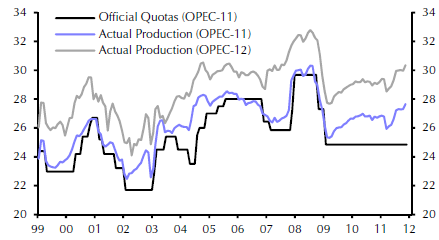 Opec-12 includes Iraq while Opec-11 does not. Even without Iraq, and with Libya constrained, the production excess is significant. The next chart is the overage by country. Iraq currently does not have a quota because of their "transition phase". Libya is obviously having "technical" difficulties meeting their quota. Otherwise the spigots are turned on. Crude oil production tends to be pro-cyclical. Because in both Opec and non-Opec nations oil companies tend to be state owned/controlled enterprises, they often operate outside of the standard supply/demand curve. Many have an annual dollar revenue budget. It means that when oil price goes lower, they pump more to meet their budget - driving prices lower. When prices go higher, they have no incentive to pump more and tend to stick to their quota, constraining supply and driving prices higher. With oil price lower in the second half of this year, it is therefore not surprising that production is above Opec quotas.